@mishkahenner’s Dutch Landscapes series, where the artist appropriates censored Google Earth images of significant political, economic, and military locations, which Dutch authorities have concealed with a stylized array of multi-colored polygons. On view starting November 4, as part of the Moving Walls 22 / Watching You, Watching Me exhibition at @opensocietyfoundations in New York. Would love to see this show in NYC — Brings up many questions about what “work” exhibitions and exhibited images do. Is visibility of, and the exposed aesthetic created by, state secrecy (the Dutch variety, in this example) an impediment or a questioning to state power? What does the registry and archival collection of secrecy’s trace produce, or is it a kind of titillation? What subjects are inscribed in this kind of work? Tomas van Houtryve’s Blue Sky Days series. Using a camera attached to a drone that he purchased, Van Houtryve photographed locations and gatherings in the United States that reference American drone use—both domestically and abroad—to reflect on privacy, surveillance, and contemporary warfare. Lately have also been thinking about the unseen dimensions of these kinds of images — what are the networks and infrastructures that create the environment for these images, and how are those secured? The space of the gallery and the space of the satellite spill into each other…? Pete Brook recently posted a report about a prison experiment in Oregon where inmates in solitary confinement are exposed to images from National Geographic in a space called “The Blue Room.” The experiment seeks to “calm the IMU’s prisoners and make its tiers safer for corrections officers,” according to another report in The Oregonian. Let’s just pause and consider what is happening here. Let’s consider the carceral logic and policies from which the Blue Room has emerged. The state has decided to isolate prisoners in bare cells, with only artificial light, in a state of near total sensory deprivation, for 23 in every 24 hours. Let’s not speculate why prisoners are isolated; I’m less interested in what behaviours land a prisoner in the harshest custody conditions, and more interested in if and how those custody conditions improve or exacerbate existing problems and/or create new problems. • Velocity: From (what else?) a TED talk to inside solitary, i.e. the startling fact that an experimental hypothesis that can have serious repercussions makes its way from TED talk to corrections officers, bypassing all manner of serious academic debates on the ethics of this test. • Sedatives: Why is it necessary to sedate prisoners with images? Is the core issue here the danger the prisoners pose to themselves, or is to about the penal guards, and why is it the academic’s role to protect the carceral system above all? Allegedly, the images prevent self-harm, but it is unavoidable to bring up the issue of who manages life in all of this bleak scenario. Does the inmate have any agency over how and where to live or not live? One might ask how this relates to force-feedings at military prisons, a practice that is considered to be torture by almost everyone except the US military. If imposing food on hunger strikers is torture, then what light does that shed on this experiment? • Time: How do academics spend and justify their time to themselves and their peers? One might sympathize with the biologist’s impulse to mitigate the harm of solitary confinement (another form of torture), but unfortunately the time spent developing a visual palliative is also time that becomes instrumentalized by the carceral system to extend, justify, prolong, and cement the administrative practices of solitary confinement. (And it is also time NOT spent on dismantling prisons). Examine the writing of the Oregonian’s reporter, Bryan Denson, and it is clear that the very act of investing time in developing a sedative technology (be it a pharmaceutical or an image montage) is time that underscores the notion of the inmate’s “incorrigibility,” thus implicitly justifying the unjustifiable practice of solitary confinement. • Media architectures: A lot has been said in the recent years about a campaign to ask architects to boycott the design of the worst forms of incarceration — namely execution chambers, solitary confinement, and supermax. The campaign against prison architecture is noble, but unfortunately too few people in architecture take it seriously. When it does get discussed in public or in print, it is often a way to bring “both sides” —the carceral designers and the boycotters— into a visible debate. I’ve had a lot of issues with this “both sides” framing because the result is a version of titillation viewing, i.e. a “serious” version of Montel Williams that entertains but ultimately gives legitimacy to torturers. 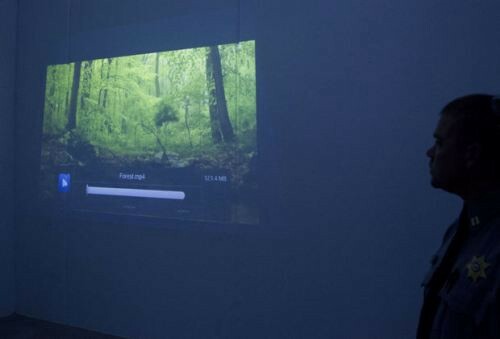 What the Blue Room begins to suggest is that audiovisual projected media is now also becoming a part of that same architecture business of incarceration, with many of the same overlaps of making incarceration more “humane”. Perhaps one way to approach The Blue Room is through the platform of the prison boycott and relate the usage of images back to many more forms of architectural and spatial control that perpetuate torture. I’ll give a very informal talk —though on a deadly serious subject matter— at the Oakland Museum of California. This talk is based on previous research events with Demilit (see Archipelago podcast and Macro City tour + review). The plan is to chat about the telegraph lines and their continuing structuring force in the contemporary city by analyzing a centrally located telecom hotel. I’ll be exploring the centralizing forces in the urban realm and the everyday ways in which historic legacies interact with surveillance. [image above is an untitled work from the Rossman Collection, via the OMCA]. Details // Pop-up Talk: Javier Arbona on the Architecture of Surveillance | Friday, November 21, 2014, 7–7:30 pm | This in-Gallery pop-up talk takes place during Friday Nights @ OMCA, featuring Off the Grid food trucks, live music, and more. | Included with Museum admission. During Friday Nights @ OMCA, from 5 to 9 pm, admission is half-price for adults, free for ages 18 and under. Admission for OMCA Members is always free. More info at OMCA. Lots of THANK YOU’s to: Demilit’s Bryan Finoki and Nick Sowers (my collaborators), as well as Martha Bridegam and John Elrick for consultations on this project; thanks equally to Suzanne Fischer at OMCA, and also to Léopold Lambert and Xiaowei Wang for sparking events that created space for this investigation to happen. The Oakland Security Cloud continues as a longer-term performance and investigation, and will also be presented at the AAG 2015 in Chicago as part of a panel I’m co-organizing with Lindsey Dillon called Bases, Bunkers, and Ports.